Dallas, TX. The Official Auctions of the FUN 2009 Convention in Orlando have been posted by Heritage Auction Galleries on their HA.com website. Spread over seven separate FUN catalogs of U.S. coins and currency were 15,000-plus lots belonging to 600-plus consignors that Heritage offered at the January convention of Florida United Numismatists. The FUN auctions realized $52 million in rare coins and $6 million in currency. A further $7 million in ancient and world coins (4,200 lots) sold at the New York International Numismatic Convention Signature® Auction. To date, more than 3,300 FUN bidders have been successful, more than one-third of the 9,000 FUN bidders participating. At FUN, 89% of the coin lots sold, and overall 87% of the lots found new owners. All lots are currently posted at HA.com for post-auction research. The totals are expected to further increase as Post Auction Buys and non-floor sessions continue. "FUN 2009 was simply amazing," enthused Heritage President Greg Rohan, "and we are pleased that 2009 is off to such a strong start. We continued to see strong demand for rare coins and currency despite the economic afflictions seen in the rest of the economy. We offered rarities across all series, and the collector community responded with strength – and we are even seeing some new clients who are turning to rare coins for diversification. Our specialty collections were especially exciting. In fact, we offered so many rarities that our Platinum Night auction, featuring our rarest and best coins, had to be spread over two catalogs and two nights. The Lemus Collection – Queller Family Collection Part Two, containing 465 different Patterns, topped $8.3 million. The Scott Rudolph Collection contributed $5.3 million to total prices realized. The Jim O’Neal Collection of Saint-Gaudens $10 Indians, the #1 All-Time Finest at PCGS in both the Date Set and Full Circulation Strike categories, realized $3.2 million. The Sanderson Family Collection of Morgan Dollars realized $2.8 million, as did the Arno Collection of Morgans. This was also Heritage’s first auction catalog to extensively feature our Video Lot Descriptions; the reception of bidders and consignors has been most gratifying. We invite you to visit HA.com and see for yourself. We also saw many clients participating – and winning – through our HERITAGE Live! online bidding system." "At the current prices realized achieved, FUN 2009 was Heritage’s – and the coin industry’s – third most valuable auction, at $57 million (and still climbing). That ranks against our world record 2007 FUN event – at $78 million – and our previous $62 million world record for the most valuable numismatic auction, at FUN 2005. These three impressive numbers tell the entire story of how incredibly important the Heritage-FUN partnership has been to numismatics." Consignments for Heritage’s upcoming February Long Beach Signature® Auction were so strong that Heritage added a new auction to their schedule: March 2-3, 2009 in their Dallas Auction Showroom (Consignment Deadline: January 16). Call Heritage’s Consignor Hotline for more details at 800-872-6467 ext. 1000. Click here For Greg Rohan’s and Todd Imhof’s videotaped comments on the FUN auctions and show. Lot 1888: 1877 Fifty Dollar, Judd-1549, Pollock-1722, R.7, PR67 Brown NGC. Realized $575,000. William Barber’s Small Liberty Head design is one of the rarest and most cherished in American numismatics. The Half Union patterns are the subject of much research regarding their unusual legal history. With beautiful iridescent surfaces, no finer specimen could exist. From The Lemus Collection, Queller Family Collection Part Two. Lot 4035: 1880 $4 Coiled Hair, Judd-1660, Pollock-1860, R.7, PR62 NGC. Realized: $575,000. Designed by George Morgan, the coiled hair head of Liberty stella is a classic American rarity. The 1880 Coiled Hair issue is clearly the rarest of the four stella varieties. Population rosters now account for nine different examples surviving from perhaps twenty minted. From The Omaha Collection. Lot 4991: 1889-CC $1 MS68 PCGS. Ex: Eliasberg/Jack Lee 2. Realized: $531,875. Carson City struck their first silver dollars in 1870, and continued into 1885, when operations of that mint were suspended. The Mint at Carson City opened again in the third quarter of 1889, but the 1889-CC Morgan dollar was one of the lower mintage issues of the entire series, with just 350,000 coins produced during the last three months. From The Estate of Jack Lee Collection. President Franklin D. Roosevelt issued presidential orders in early 1933 halting the release of gold coins from the Mint, and recalling gold coin, gold bullion, and gold certificates, thereby creating several noteworthy rarities in the 20th century gold series. The Philadelphia Mint opened 1933 with a delivery of 312,500 eagles in January and February, but only a few – perhaps 30 to 40 pieces – were legally released through regular channels at that time. From The Jim O’Neal Collection of Saint-Gaudens Eagles. See HA.com for Video Lot Description. Lot 4062: 1815 $5 MS64 NGC. Breen-6469, BD-1, R.7. Realized: $460,000. Unlike many of the old-tenor gold issues, the 1815 half eagle does not owe its rarity to the massive gold melts of the 1820s and ’30s. With a minuscule mintage of just 635 pieces, the 1815 was rare from its date of issue. From The Deb-Ann Collection. See HA.com for Video Lot Description. Morgan dollars are part of the bedrock of U.S. coin collecting. A major impetus toward increased collector interest was the Pittman Act of 1918, which spurred the melting of more than 270 million silver dollars – the great majority of them Morgan dollars. Of the several MS67 pieces we have auctioned over the last dozen-plus years, this ex: Eliasberg piece is at the top of the pack. From The Arno Collection. See HA.com for Video Lot Description. Lot 3527: 1920-S $10 MS66 PCGS. Realized: $431,250. This year marked the first production of gold coinage since 1916. Soon after 126,500 eagles were struck at the San Francisco Mint in 1920, they were considered one of the rarest of all 20th century ten dollar gold coins. The Population is 1 in 66, with only 1 finer. From The Jim O’Neal Collection of Saint-Gaudens Eagles. See HA.com for Video Lot Description. Lot 1962: 1915 Panama-Pacific Half Dollar, Judd-1960, formerly Judd-1793, Pollock-2031, High R.8, PR64 NGC. Realized: $345,000. One of only two known specimens; struck in gold as the regular silver-issue, but lacking the normal S mintmark. These extremely rare patterns were clearly clandestine strikes, produced at the Philadelphia Mint before mintmark punches were applied to the working dies. They were possibly created for Treasury Secretary William Gibbs McAdoo (a coin collector)! From The Lemus Collection, Queller Family Collection Part Two. Lot 3520: 1913-S $10 MS66 PCGS. Realized: $299,000. Only 66,000 pieces were produced of the 1913-S, and most circulated (most are known today in VF to Choice AU condition). The two services have graded a mere three MS65 specimens, one Premium Gem, and two Superb Gems. From The Jim O’Neal Collection of Saint-Gaudens Eagles. See HA.com for Video Lot Description. Lot 3529: 1930-S $10 MS67 PCGS. Ex: Duckor. Realized: $299,000. The end of the ten dollar denomination was fitful, with a decade falling between the famous 1920-S eagles and the 1930-S pieces, with the lone Philadelphia issue of 1926 intervening. From The Jim O’Neal Collection of Saint-Gaudens Eagles. See HA.com for Video Lot Description. Lot 3762: 1841 25C PR66 NGC. Ex: Pittman-Kaufman. Realized: $299,000. This is the only Gem-quality proof 1841 Seated quarter in existence, and also the finest of just four proofs that are available to collectors, so far as we know. From The Scott Rudolph Collection. See HA.com for Video Lot Description. Lot 3764: 1844 25C PR66 NGC. CAC. Ex: Pittman-Kaufman. Realized: $299,000. The rarity of the 1844 proof quarter is easily established: this is the solitary example certified by either NGC or PCGS. This NGC-graded PR66 coin pedigreed to the John Jay Pittman and the Phil Kaufman collections, and is now From The Scott Rudolph Collection. See HA.com for Video Lot Description. Only one die pair is known for the 1893-S silver dollars, and it was utilized to coin 100,000 pieces according to long-established records, although recent research suggests that the real mintage was just 77,000 pieces. Either figure places this issue at the top of the list of lowest business strike mintages of the series (discounting the 12,000 1895 dollars supposedly struck but never seen). From The Sanderson Family Collection. See HA.com for Video Lot Description. Lot 3501: 1907 $10 Rolled Edge MS66 PCGS. Realized: $276,000. Unlike the 1907 Wire Rim Indian gold eagle, the similarly dated Rolled Edge delivery was intended for general circulation. To protect the surfaces and eliminate the problems associated with the high wire rim, the Mint modified the original Indian eagle design to include a protective rim. All but 50 examples to be melted prior to release. From The Jim O’Neal Collection of Saint-Gaudens Eagles. See HA.com for Video Lot Description. Lot 4131: 1856-O $20 XF45 PCGS. CAC. Realized: $276,000. Aside from the non-collectible pattern 1849 twenty, three mintmarked issues stand alone among Liberty double eagles as the titans of the series: 1870-CC; 1854-O; and the 1856-O. Lot 1500: 1792 Pattern Cent, Judd-1, Pollock-1, High R.6, VF30 NGC. Realized $253,000. With a design most likely by Henry Voight, the patterns of 1792 are the rarest series of patterns ever struck, and each is a classic of U.S. coinage in its own right. This exclusive series includes the silver center cent, Birch cent (two varieties), half disme, disme, and the Eagle on Globe quarter. Of these five issues, only the half disme and disme ever circulated. From The Lemus Collection, Queller Family Collection Part Two. Lot 4990: 1889-CC $1 MS65 NGC. Realized: $253,000. The vast majority of the silver dollars minted in 1889 were actually paid out and entered circulation in the late 19th century; the result is a relatively plentiful supply of worn examples, and a lack of Mint State pieces. Only four other MS65 examples have been certified by NGC. From The Sanderson Family Collection. See HA.com for Video Lot Description. Lot 3766: 1853 25C Arrows and Rays PR66 Cameo NGC. Ex: P. Kaufman. Realized: $230,000. The 1853 issues are considered the rarest and most desirable proof Seated Liberty coins. All denominations are rare, especially the quarter dollar and half dollar. Census: 1 in 66 Cameo, only 1 finer (10/08). From The Scott Rudolph Collection. See HA.com for Video Lot Description. Lot 3736: 1831 25C Large Letters PR66 Cameo NGC. B-5, R.7 as a proof. Realized: $218,500. The strike (or strikes) was so powerful and exacting that details not typically seen on even the finest business strike examples of this issue are clearly visible: the most intricate details within the recesses of Miss Liberty’s hair and the nuances of every feather on the eagle’s wings. The specimen offered here represents not only the finest quality available for the date, but also an important provenance. Ex: Richard Picker; Norweb Collection; From The Deb-Ann Collection. Lot 3926: 1795 $1 Flowing Hair, Three Leaves MS64 PCGS. B-7, BB-18, R.4. Realized: $218,500. The Flowing Hair silver dollars of 1795 are sometimes overshadowed by their famous cousins of 1794, but this specimen will stand out with its uncommon virtues and illustrious pedigree. Ex: Peter Mougey Collection; John H. Clapp; Clapp Estate; Louis Eliasberg; From The Estate of Jack Lee Collection. Lot 1887: 1877 $50, Judd-1547, Pollock-1720, Low R.7, PR65 Gilt NGC. Realized $207,000. William Barber’s Large Liberty Head design shows Liberty facing left, with a coronet bearing her name. The Large Head shows the tip of the coronet between stars 5 and 6 while the Small Head has the tip below star 6, and the date is considerably closer to the bust truncation on the Large Head. With the two unique gold half unions in the Smithsonian’s National Numismatic Collections, the copper pieces (gilt or not) never fail to inspire intense bidding competition. From The Lemus Collection, Queller Family Collection Part Two. One of few Gem survivors of an entire gold series; of all Capped Bust eagles struck between 1795 and 1804, only 24 examples have been certified at the MS65 level by NGC and PCGS combined, with just three specimens, each MS66 coins, grading finer. Population: 3 in 65, 0 finer (11/08). From The Estate of Jack Lee Collection. Lot 4216: 1915-S Panama-Pacific $50 Octagonal MS67 NGC. Realized: $207,000. The Panama-Pacific fifty dollar octagonal gold commemorative is one of just eight classic gold commemoratives (produced from 1903 to 1926), echoing the gold pieces first produced by Augustus Humbert in 1851 as United States Assayer of Gold in California. The commemorative has been popular since it was released during the Panama-Pacific International Exposition in 1915. Neither NGC nor PCGS has certified an example finer than MS67. From The Scott Rudolph Collection. See HA.com for Video Lot Description. Lot 4033: 1879 $4 Flowing Hair, Judd-1635, Pollock-1833, R.3, PR66 Cameo PCGS. Realized: $195,500. 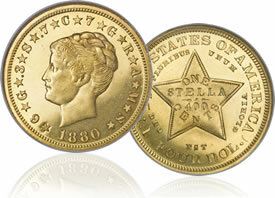 The stella, or “golden star,” is the dream of most collectors to own, in any grade, or even an off-metal experimental strike. Despite the controversy surrounding the issue, its rarity and desirability remain undeniable. From The Scott Rudolph Collection. See HA.com for Video Lot Description. Lot 3640: 1916 Nickel Doubled Die Obverse MS64 PCGS. FS-101, FS-106. Realized: $195,500. While certain older references describe this legendary Buffalo nickel variety as a “doubled date” variant, the source of the doubling is not from repunching, as likely would have been the case were this a 19th century piece, but is the result of hub doubling. From The Scott Rudolph Collection. See HA.com for Video Lot Description. Alexander Hamilton has been called the “Grandfather of the 1794 Dollar.” At the request of Congress, Hamilton prepared an exhaustive report on “a proper plan for the establishment of a national Mint.” His report was delivered to Congress on January 28, 1791, and by all accounts was a brilliant and clear report on the principal issues, including valuation. Known as the Frothingham Specimen, this 1794 dollar has a rather unusual early history, being stored in an attic for many years. It is an amazing coin with a bold strike. Lot 4158: 1891 $20 PR67 Ultra Cameo NGC. Realized: $184,000. Shortly after the 52 1891 proof double eagles were struck, George Heath and friends convened with 61 American Numismatic Association charter members at the Commercial Hotel at the corner of Lake and Dearborn streets in Chicago for the inaugural convention. Fortunately, some of the collectors who procured proof coins from the Mint were astute custodians of these numismatic delicacies. From The Scott Rudolph Collection. See HA.com for Video Lot Description. Lot 3841: 1807 50C Specimen 65 PCGS. Realized: $161,000. This Overton-109 is unique as a specimen strike. In 1807, when Reich joined the Mint as assistant engraver, the half dollar designs were modified yet again, this time to the familiar and ubiquitous Capped Bust or Turban Head design. This coin has the deepest prooflike surfaces seen on any Draped Bust half dollar. Prior to 1817, PCGS uses the prefix SP for these special coins or specimens, while Mint terminology of the era most often called them Master coins. These equate to Proof coinage of later years. Lot 4210: Farouk’s Five-Piece 1915-S Panama-Pacific Commemorative Set With Cases and Documentation, Realized: $161,000. Pedigreed to King Farouk and the Palace Collections of Egypt: i) Half Dollar MS66 NGC, CAC; Gold Dollar MS66 NGC, CAC; Quarter Eagle MS64 NGC, CAC; $50 Round MS63 NGC, CAC; $50 Octagonal MS64 NGC. Lot 3920: 1794 $1 VF30 PCGS. B-1, BB-1, R.4. Realized: $143,750. Collectors have avidly pursued the 1794 silver dollars from the earliest days of the hobby. Of course, no collection of early silver dollars can be complete without this premier date. The strike weakness on the left obverse of most coins is the result of inadequate equipment used by the Mint in its initial attempt at large silver coinage. From The Estate of Jack Lee Collection. Lot 1964: 1916 Walking Liberty Half Dollar, Judd-1994, formerly Judd-1801, Pollock-2059, R.8, PR64 NGC. Realized $115,000. The letters in LIBERTY on this pattern are heavy and slightly further from the rim than on the regular issue, closer to Liberty’s foot. The reverse is also similar to the regular issue, but it lacks the AW monogram (for designer Adolph A. Weinman) behind the eagle, to the right of the rock, which was placed on the regular issues. Only two or three examples are known of this extremely rare pattern. From The Lemus Collection, Queller Family Collection Part Two. The 1886-O Morgan has a generous mintage, is common in low grades, but high-grade Mint State coins remain rarities. This ex: Eliasberg coin is one of just three MS65 examples certified by PCGS, with none finer at that service (11/08). From The Arno Collection. See HA.com for Video Lot Description. Lot 1938: 1880 Flowing Hair Four Dollar, Judd-1659, Pollock-1859, High R.7, PR65 NGC. Realized $97,750. Struck in aluminum, gilt, with a reeded edge. When compared to the obverse of the 1879 Flowing Hair stellas, the 1880 date is markedly smaller and shifted, nearly touching the lowest hair curls and well separated from the denticles. From The Lemus Collection, Queller Family Collection Part Two. Lot 1503: 1794 Half Dime, Judd-15, Pollock-19, R.8, AU55 NGC. Realized $74,750. This is one of the two known examples of Pollock-19. The 1794 half dime was the first coin of this denomination struck at the U.S. Mint, because the famous 1792 issue was actually struck in John Harper’s cellar before the Mint was built. Possibly Ex: Joseph Mickley; Col. Mendes I. Cohen; Jules Fonrobert; Auction ’85; From The Lemus Collection, Queller Family Collection Part Two. Out of approximately 150 1899 quarter eagles, it is believed that 100 still exist; out of that number, the certification services have graded more than 250 examples. Therein lies the problem with population data – resubmissions – yet there is no denying that at the PR68 level the number becomes more telling. This is the finest 1899 proof quarter eagle to ever cross the block at Heritage. For more information about Heritage’s auctions, and a complete record of prices realized, along with full-color, enlargeable photos of each lot, please visit www.HA.com. To reserve your copy of any Heritage auction catalog, please contact Client Services at 1-800-872-6467, ext. 150, or visit www.HA.com/Catalog to order by email. Heritage Auction Galleries is the world’s third largest auction house, and by far the largest auctioneer of rare collectibles, with annual sales over $700 million, and 400,000+ registered online bidder members. For more information about Heritage’s auctions, and to join and gain access to a complete record of prices realized, along with full-color, enlargeable photos of each lot, please visit www.HA.com.